I’m big on card efficiency and resource management. Cards that reward players for interacting with opponents, and ones that rely on stocked graveyards, are among my favorites. 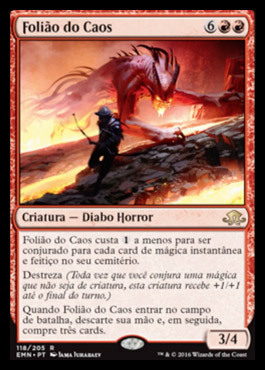 So I’ve savored this new Innistrad spoiler season more than any since delve was announced in Khans of Tarkir. Traverse the Ulvenwald is my favorite card this side of Treasure Cruise, and with Eldritch Moon, the infamous blue sorcery gets a reboot on legs. As if that weren’t enough, Tuesday’s Moon even shined its light on a delirium-reliant Tarmogoyf. This week, I spent an inordinate amount of time testing and in Tarmogoyf/Stubborn Denial decks. Both cards impressed me, but I have a feeling one will make more of an impact in Modern than the other. German Threshold is a BURG Delver deck with Legacy origins. In 2013, a team of German deckbuilders splashed Deathrite Shaman into their Canadian Threshold decks for GP Strasbourg. None of them made Top 8, but the greedy tempo deck never totally left the format. Noah Walker first introduced me to the archetype at GP New Jersey a year later, where he played a Cruise-powered German Thresh deck with Young Pyromancer over Tarmogoyf (the spiritual predecessor to Grixis Delver, a deck he debuted in the same room as my own Monkey Grow last summer). Until now, black hasn’t had much to offer Modern grow strategies, as Tasigur, the Golden Fang already has a functional analog in Hooting Mandrills. But the spoiling of inspired me to port the deck to Modern. In practice, German Thresh plays similarly to Monkey Grow, but sits closer to midrange on the archetype spectrum. The deck’s many colors force us to abandon Disrupting Shoal, whose functions are fulfilled to some degree by Spell Snare and Abrupt Decay. It picks up hard creature removal, Tasigur, the Golden Fang, and . fills out the strategy as Goyfs 5-8: Bolt-proof, ferocious-enabling two-drops that pressure opponents or wall their attackers as needed. Granted, Hooting Mandrills does something similar, but Flayer’s extra ability is the real reason to splash black. This filtering effect allows us to stabilize or end games that much quicker, stacking Stubborn Denials and Lightning Bolts to the top of the deck while tossing excess lands in the trash. Gitaxian Probe and Serum Visions let us immediately draw a card left on top when cast post-combat, helping us always have a counterspell at the ready once Flayer gets swinging. Mishra’s Bauble plays a key role in quickly activating delirium. Against red decks, we never want to slam as a 2/2, so stocking the grave with a fourth card type is crucial to the human newcomer’s effectiveness. Bauble also interacts passably with Delver of Secrets despite its artifact type, activating on an opponent’s end step to give pilots two tries at transforming the 1/1 into Insectile Aberration. German Thresh’s manabase follows the same rules as Counter-Cat’s. The deck wants to assemble two core shocks (Crypt + Pool or Grave + Ground) as early as possible, allowing it to cast any spell in the deck. Island is our preferred third land, as we rarely want to take more than 7 damage from our manabase. Polluted Delta fetches every land but basic Forest, making it our most valuable fetchland; Verdant Catacombs only misses Island, and Misty Rainforest fails to find Blood Crypt and Swamp. When expecting a Blood Moon from across the table, pilots should prioritize fetching Island, Swamp, and Forest, leaving the red source for last. We already know the answer to this question: Sultai doesn’t have Lightning Bolt. Bolt is integral to goodstuff interactive decks in Modern, especially ones that live and die by card efficiency and flexibility. “Bigger” interactive decks like UW Control might get by without Bolt, but tempo and midrange decks lean heavily on the card to get them through the initial rush from Infect, Burn, and Affinity, or to burn out stabilizing Tron players. I’ve tried bypassing the Bolt-block in Sultai before by running Disrupting Shoal. While Shoal won’t reach out decks that go over fair strategies, it covers the red instant’s tracks against linear aggro. But running , Abrupt Decay, and Mishra’s Bauble bars us from supporting that card, which demands at least 22 blue cards to function optimally. If we want to stay in Sultai, our only feasible option is to add red. The first two aid Sultai tremendously, but the last two fall flat in German Thresh. We lose out on including Blood Moon with so many colors. German can never resolve a safe Moon until turn four (one turn each to fetch our basics, plus a turn to make a red land drop), making the card significantly worse. As for Huntmaster, he adds to our arsenal, but I wouldn’t call him integral to German Thresh the way he is to Monkey Grow. Sultai colors give deckbuilders plenty of other midrange options, including Traverse the Ulvenwald and Kalitas, Traitor of Ghet. We may only reap the bare benefits of playing red in German Thresh, but I still don’t think the deck can work without Bolts. is a superb card, but playing him in a competent Modern deck requires deckbuilders to jump through quite a few hoops. After a full day of tuning and online grinding, I missed Blood Moon too much to want to turn the ugly little guy sideways anymore. I had twiddled my thumbs for less than a day when was spoiled, launching me back into brew mode. Like Traverse the Ulvenwald before it, is poised to redefine the way I brew in Modern. Spell-based combat decks everywhere will want this card, and Temur Traverse is no exception. My latest build abandons some of the mainboard toolbox elements for more blanket interaction and a synergistic shell that maximizes the power of this 3/4 Treasure Cruise. Compared with previous iterations of Temur Traverse, this build adopts more of a jack-of-all-trades approach, combining efficient creatures, hard removal, countermagic, and tutoring to play a competent midrange game. It trades away some toolbox targets to ramp up the spell count and enable , who handsomely earns his inclusion. Part of making Reveler work involves ensuring the graveyard approaches six instants and sorceries by the midgame. I started with a set of Thought Scour, but still found the creature lacking. The solution was to cut Mishra’s Bauble to zero and max out on Gitaxian Probe, which casts multiple Lotus Petals in this deck when it comes to chaining Revelers. Probe also ensures Goyf resists Lightning Bolt by turn two, improving our early game against aggro and midrange. And once Reveler works, boy, does he work. I play the card differently depending on the matchup. Against decks like Tron or Ad Nauseam, he comes down as early as possible, usually causing me to lose a land or a cantrip but making up for it with his aggression. He can still be a bit slow in these matchups, and I prefer Goyf or Dryad to pressure opponents. Reveler’s at his best in midrange mirrors. Anyone trying to win via attrition, including Jund, Grixis, and Jeskai, has a very hard time beating “draw three cards” on a Bolt-proof, Decay-proof body. For perspective, that’s a four-for-one, except the fourth card isn’t another random draw, but a respectable threat. Since Reveler frequently costs two mana, he’s even tough to Mana Leak. I save Reveler in hand against these decks until I’ve exhausted all my other cards. Testing against Jeskai Control, a fairly tight matchup for my other editions of Temur Traverse, has yielded overwhelmingly positive results. After Jeskai spends its resources dealing with Tarmogoyf, Gnarlwood, and Snapcaster Mage value plays, Reveler comes out of our empty hand to pull way ahead on cards. Like Treasure Cruise, Reveler even brings his buddies. Those dark, delicious days favored the blue mage able to resolve the first Cruise, which would start a card advantage snowball; that lucky early bird always seemed to have Remand ready for his opponent’s tardy delve spell, and another Cruise at the ready once he exhausted his cheaply acquired fuel. Similarly, the three cards we draw off Reveler are likely to feature either Traverse the Ulvenwald, Snapcaster Mage, or , all of which translate into, well, another . A Traverse or Snapcaster peeled with the Reveler can also give flashback to a Scoured-away Stubborn Denial, which triggers prowess on the stack and turns on ferocious with Reveler still in play. This interaction can prove very difficult for grinded-out opponents to overcome. Reveler’s wording also evokes a card that famously failed to live up to my great expectations: Day’s Undoing. Since his 187 ability forces us to discard our hands before drawing three cards, we can’t stockpile advantage in hand and pull even further ahead with the Reveler, like we could with Treasure Cruise. Instead, Reveler asks us to spend our cards before casting a “pure” Ancestral Recall. I’m not too worried about this drawback. If we can build decks designed to quickly run out of cards to abuse Day’s Undoing, we can build decks that do the same to abuse . The key difference between Reveler and Undoing: Reveler’s advantage is one-sided. Undoing’s big downfall ended up being its unfortunate tendency to inadvertently benefit opponents, making it terrible with opponents ahead in the game. Reveler gives us a huge advantage whenever we don’t have a swath of cards in hand, and when we do, we can simply cast those instead and reap his advantage later. An interesting question with this deck is whether to include Delver of Secrets. With 26 instants and sorceries, including Serum Visions, the deck easily has enough juice to transform the creature reliably. But in this list, I’ve foregone Delver in favor of . Both creatures are Bolt magnets whose corpses contribute to delirium against interactive strategies, but they truly shine against Modern’s linear decks—and each option in its own way. Dryad does a couple of novel things in this shell. For one, he shores up aggressive matchups. Temur Traverse is a much more midrange-focused deck than Temur Delver, meaning its late-game dwarfs that of many aggro decks. When you’ve got Goyfs, Snapcasters, and walking Cruises, you tend to wish your Delvers were removal spells against decks like Zoo and Burn. Gnarlwood at least trades with a creature, and he outright walls others, like Kird Ape and Goblin Guide. He can also buy time versus midrange by deterring Tarmogoyf or a souped-up Scavenging Ooze from invading our personal space. In a deck that can draw Snapcaster Mage, Traverse the Ulvenwald, or himself and immediately refill against these creature-based attrition strategies, buying time often ends up buying the game. Against interactive decks, Dryad outshines Delver of Secrets. Makes sense, since nobody would purposefully play Delver against those decks. I agree with Grixis Delver aficionado Ryan Overturf’s analysis of the big reasons to play Delver in a URx Snapcaster Mage strategy: the creature puts enormous pressure on degenerate decks that either get under or go over the top of midrange strategies. The “go under” decks include Burn, Zoo, Affinity, and Infect; the “go over” decks mostly just include Tron. Against big mana, Dryad and Delver size up pretty evenly, except Delver flies over a late-game Wurmcoil Engine and Dryad resists Pyroclasm. Dryad holds some points over Delver against Burn and Zoo, as explained above, while slowing down strategies like Infect and Bogles by incentivizing them not to attack—even a swinging Glistener Elf backed up with a pump spell dies to a blocking Dryad, while Delver would suffer the full Might of Old Krosa in the same situation. The one deck Delver exceeds against is Affinity, since it plays better defense there than Gnarlwood can. Of course, all these examples assume Temur Traverse wants to play a midrange game, every game. Delver of Secrets gives his summoner the unique opportunity to steal a win in the air from creature-casting opponents whose awkward hands don’t come together, punishing stumbles like no other creature in Modern. 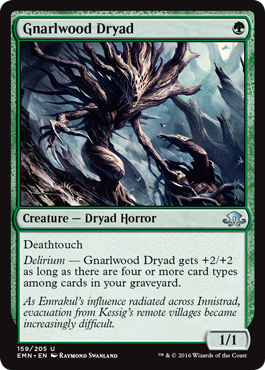 Another massive strike against Dryad is that Delver becomes a three-power creature much earlier than his green counterpart against decks that refuse to interact with us, and therefore make it difficult to turn on delirium barring a Tarfire opener or a lucky Thought Scour. Some of these decks, including Tron and Ad Nauseam, will demolish Temur Traverse if it fails to pressure early. For these two reasons, Delver also merits testing in this shell. I just haven’t gotten around to trying him yet. Whether this elegant design characteristic was purposefully met by Wizards of the Coast or not, I’m sure we can agree that the result stands to benefit the format greatly by offering players even more deckbuilding possibilities without turning any of Modern’s usual suspects oppressive. I’m adding this section 90 minutes before publication because the just-mentioned UR Burn deck has tested so phenomenally in the last few hours. Nothing beats casting Vapor Snag on your own Reveler in response to a Terminate. Check it out! Loving the Temur and UR decks. Time to sleeve up! Hey Jordan! Warning: no native speaker ^^ While i really love the idea of going full graveyard, i guess this might be one of the weaknesses of the deck. That’s why i like your approach with splashing black for Liliana as another angle for attack pretty much. Against this list, RiP and Relic pretty much ruin your day and i have the feeling that WotC wants to “see” more graveyard hate in Modern because they recently printed some actually pretty playable, strong new graveyard interacting cards (Traverse the Ulvenwald, Insolent Neonate, Chaos Reveler, Gnarlwood Dryad and the (potentially playable) Splendid Reclamation). If an opponent resolves RiP (to which u have no answer) the best u will do is flashing in some blue Ambush Vipers. Maybe this could be an argument for Delver over Dryad? Are these kind of losses “calculated”? Let me know what you think! That’s definitely a good reason to play Delver of Dryad, nice catch. Rest in Peace has been pretty difficult for me to overcome with this kind of deck, a problem dating as far back as my early experimentations with Traverse in Eldrazi shells. Playing cards like Thought-Knot Seer or Liliana of the Veil greatly alleviate this issue, just as threats like Delver, Moon, and Huntmaster do in Monkey Grow. But I’ve gone full graveyard lately after noticing a distinct lack of RiP both in my local metagames and in the larger Modern field. Relic, in my experience, is much easier to beat than the enchantment. But there’s always Destructive Revelry if it starts showing up more, or graveyard-independent beaters like Vendilion Clique. Yeah, graveyard hate is (shockingly) absent in my local meta, too. I guess with mandatory hate slots like Crumble to Dust or Stony Silence (takes up 4 slots in my Jeskai Nahiri alone) people have a hard time of dedicating slots to sth like RiP. It might be possible to kinda “fly under the radar” with your deck, but i personally feel uncomfortable to go “All-in”. Has Thing in the Ice as a non gy based threat a place in the 75? Almost definitely not. But I’ve never been impressed with that card despite having tried it in a bunch of shells. 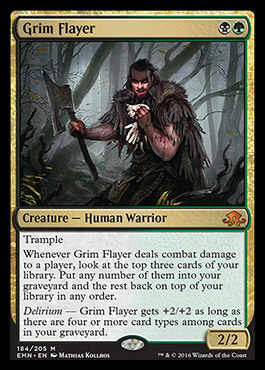 I kind of feel silly for not immediately detecting Grim Flayer’s potential in grow-style tempo because I got too hung up on its forcing a 4th color splash. As Hooting Mandrills has taught us, 4/4s with trample for 2 (or less) are quite playable. Having to cram in black makes me a tad uneasy, but it very well may end up being worth it. As for Bedlam Reveler (this is what they officially named it in the full spoiler today)… I was originally viewing through more of the aggro-orinted “vomit out hand, cast, continue to vomit out hand” role it will be auditioning for in Legacy, but you’re probably correct about decks like Monkey Grow and Temur Traverse also making good use of it as a way to surge ahead against midrange. Now, here’s a question concerning one of your earlier brews – do you think you can cram in the instant/sorcery density necessary to cast it in RG Moon? Because if you can, I think it’s marvelously positioned there, since any future artifacts and enchantments also trigger prowess. As for Bedlam Reveler (this is what they officially named it in the full spoiler today)… I was originally viewing through more of the aggro-oriented “vomit out hand, cast, continue to vomit out hand” role it will be auditioning for in Legacy (and maybe even Modern Burn), but you’re probably correct about decks like Monkey Grow and Temur Traverse also making good use of it as a way to surge ahead against midrange. Now, here’s a question concerning one of your earlier brews – do you think you can cram in the instant/sorcery density necessary to cast it in RG Moon? Because if you can, I think it’s marvelously positioned there, since any future artifacts and enchantments also trigger prowess. why focus on grim flayer in a grow strat when it seems really dope in GBx as a way to card filter in late game. Because by the time BGx has delirium on, they have enough mana to cast something more impactful than Flayer, like Kalitas. Really like the look of the UR Delver deck you put together. It’s similar to something I was messing around with. Have you continued testing with it over the last few days? Anything you would change? Have people considered Architect of Will for Delirium decks? It’s not quite as good as Bauble, but it puts two types in the graveyard asap and immediately replaces itself with a card, so it has some upside. Fetch, Cycle, Phyrexian Mana (Gut Shot or Probe) and you can turn on Delirium turn 1, without playing the Tome Scour roulette, and haven’t lost a single card. I tried it, but it just didn’t do enough. Architect is bad for the same reasons Wraith is. At least Bauble and Probe have useful effects in addition to cantripping.